Integrated Pest Management: We Do Snake Control, Too! When people think of pest control, the bugs that normally come to mind are bed bugs, cockroaches, and termites. People also think of mice and rat extermination, and while here at Colorado Pest Management we do handle these common critters, our pest control services extend well beyond these commonplace problems. Additionally, our methods are not what people have come to expect from the run of the mill pest control company. In this week’s article, we’ll go over some of the lesser-known services we offer and how our methods differ from other companies. Pest control often conjures up images of men with big tanks of chemicals that kill everything and anything. Integrated Pest Management (IPM) is different. IMP uses practical, common sense methods to rid your home of pests and to keep them out. Our methods include efforts to remove what attracts pests, including food, water, and nesting. We prioritize humane methods and always use environmentally conscious solutions to pest problems. Living in Colorado offers us the good fortune of living close enough to wildlife that we become used to seeing elk blocking traffic, deer watching us pass by, and bald eagles soaring overhead. These are amazing creatures to see, and they are a sign of a healthy, balanced ecosystem. What nature-loving Coloradoans don’t want to see is certain wildlife close to their homes. One such category of wildlife is snakes. 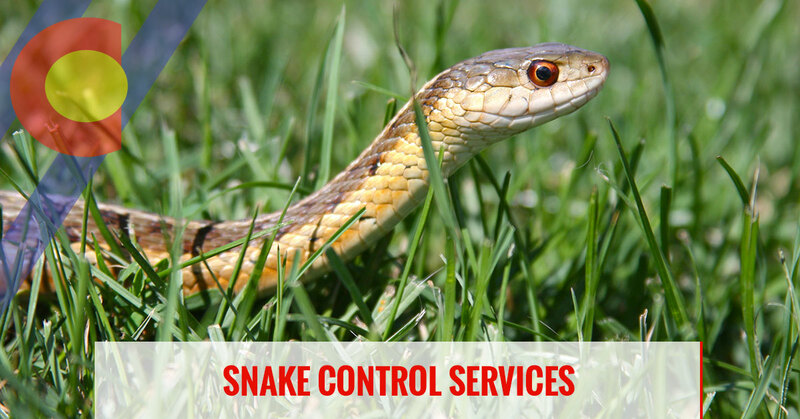 If you have snakes around your home and want help controlling them, call us for a consultation. We do charge for wildlife consultations since they take specific expertise. It’s important to remember that not all snakes need to be a source of fear and loathing from humans. This fear seems to be rooted in some sort of primeval misunderstanding of these creatures. Some people have such innate distaste for snakes that they won’t be in the same room as them, let alone be happy to have a snake live in their woodshed. But it’s important to remember that snakes play an essential role in the ecosystem. Snakes contribute to rodent control and in turn are food for coyotes and birds of prey. Some people will counter that they also bite people and dogs, and while this is true of some snakes, it is far from all snakes that are venomous. Therein is the difference. It depends on if you are speaking of all snakes or some snakes, and so it is essential to know the good snakes from the snakes that are dangerous to have close to people and pets. Colorado has lots of snakes, and because of our varying geography and weather, there are lots of specific niches that snakes can fill. Our gardens hold helpful garter snakes, recognized by the ribbon of yellow down their spine, and blind snakes that are often mistaken for large earthworms. When people think of pest snakes in Colorado, the first snake to come to mind is usually the rattlesnake, and this is definitely a snake that should not be ignored. How you respond to the presence of one of the two species of rattlesnake depends on where you live and where it is. Most towns in our service area, from Fort Collins and Boulder to the Denver suburbs of Arvada and Englewood, can support a rattlesnake population but there is the difference in seeing a rattler on your large property in the foothills and seeing one in your screened in porch in Thornton. In most instances, rattlesnakes can be caught safely and relocated. Bull Snake or Rattle Snake? Bull snakes are also very common and can be mistaken for the rattlesnake at first glance. The surprisingly docile bull snake’s habit of shaking its tail and hissing doesn’t help it make any friends, but if you can look at its head (not too close! ), its head lacks the tell-tale triangle shape that is formed by venom pits in venomous snakes. Another sign to look for is the position of the eyes. A rattle snake’s eyes are forward-facing while a bull snake’s eyes are clearly on the sides of its head. If you have a big snake in your bathroom, garage or several of them in your wood shed and don’t feel up to handling the situation yourself, give us a call. Unless you are experienced in dealing with rattlesnakes, you could end up getting bitten, and no one wants that. We will not only remove the snake but can do an inspection and exclusion plan to put in place to find out how the snake got in your house and how to keep them out.